RPOs are ran to put the defense in conflict and it is up to the quarterback to put the ball where the defense isn’t. It’s a numbers game. Get the ball to your best athletes and let them run in open space. Variations of the RPO we have written about in this article are pre-snap RPO, triple option RPO, QB pin and pull RPO, counter RPO and two back flat RPO. Throughout this blog I will explain different types of RPOs and the reads that quarterbacks must execute in order to be successful on the play. For a full video breakdown of each RPO, view our most recent live clinic, which takes place every Tuesday night at 8pm EST on both Twitter & Youtube. Read: Depends on how your team wants to run it. For the example shown above, the read will be the corner . In a 3×1 set (trips) formation is what we’ll use for our example. The corner covering the single receiver will be our read. The wide receiver has two options : run a quick fade route or run a 5 yard out. The wide receiver and QB will make their read depending on how far off the corner is . For example , if the corner is pressed up on the receiver , this means that the receiver will run a quick fade route. The QB will usually want to place the ball in between 15-25 yards downfield , giving the receiver the best chance to go and make a play. However , if the corner is 10 yards off , the receiver will run a 5 yard out. In the photo below , the corner is tight on the receiver, which means that there must be a fade route ran. The QB should the ball in the end zone, since they are so close to it. 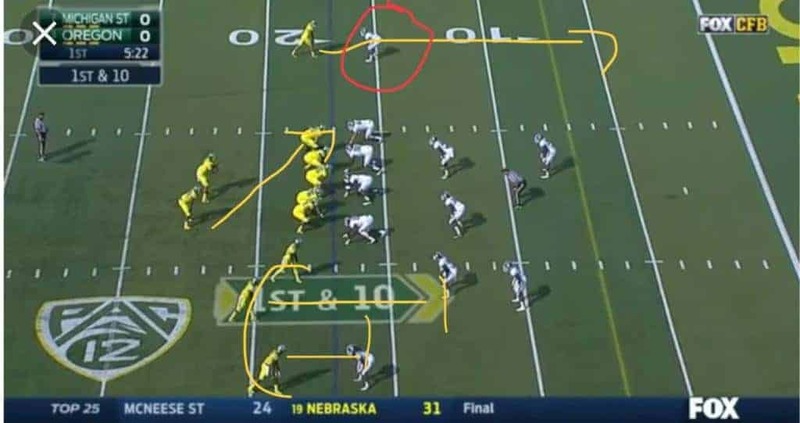 Ohio State running their Triple Option RPO named "Atlas"
Read: First run read is the backside Defensive End. The second run read is the outside linebacker . If the Outside Linebacker (OLB) comes up for the QB, he will make his 3rd read, throwing it to the receiver . In the play above, Braxton Miller is playing QB for Ohio State. The defensive end crashes down to attack the running back , so Miller pulls the ball to run it himself and get his eyes immediately towards his 2nd read. He quickly sees the OLB come up to hit him, so he gets his eyes on his receiver and hits him for a big completion. Oklahoma with a Counter RPO. Motioning the fly sweep shows Mayfield coverage is man to man. Reads the crashing end and sees his fly man has space = throws the fly bubble. Read: The QB is reading the safety that is rolled up about 7 yards away from the Defensive End . If he comes up for the run, the QB throws the bubble. Here we have a double option, meaning the QB can either hand the ball to the running back or throw the bubble . The receiver is in a “jet” motion and is running a bubble after the QB snaps the ball. In the play above, Baker Mayfield sees that the safety comes up for the run, which indicates that he must the bubble. The corner that is manned up on the receiver in motion and has a far distance to run. This is a great play to beat man coverage. Virginia Tech with a Pin & Pull Sweep RPO ran with the QB. Virginia Tech runs this with the right guard and right tackle blocking down, with the center pulling around to get a “second level” defender. That is no easy task for a center and it is quite impressive to see it executed. When the QB sends the RB in motion , he sees his read start to cheat out to where the RB is going. So pre snap he reads that he will be taking the ball and his post snap read affirms that , when the LB fly’s out to the push motion. The QB then follows his center and gets a solid gain on the ground . Read: Run read is the Defensive end . If he crashes down, QB pulls the ball. If he stays with the QB, he hands it off. Pass read is the frontside LB. If he runs to the flat , the QB will keep it. If he comes up for the QB , he will throw to the H-Back on the flat route . We have another triple option RPO. The Defensive End crashes down, the frontside LB plays the run and the QB makes them pay for it . The QB does a good job of getting the ball out quickly, not giving the D end a chance to get involved in the play again. RPOs are all about numbers. Put the ball where the defense isn’t. There are so many variations of the RPO and we just touched on a few of them . They are becoming a huge part of our sport from youth to high school and especially college and pro. How do you implement you RPO’s? Let us know in the comments below! Does my QB need to be atheltic in order to run RPOs? No, he does not have to be a great athlete in order to run them . However , the triple option RPOs are where they might struggle if they’re not athletic. Are RPO’s hard to teach a QB that has never ran them before? It depends on the QB. If the QB is intelligent and listens to a coach that knows what he is talking about , he/she will be fine. The QB must be disciplined by following his read keys, or else bad things will happen during the play. Can I run A RPO From Under Center? Yes! RPO’s are not just for teams that run shotgun. RPO’s are typically run from shotgun because it gives the quarterback a better field of vision. Teams have implemented RPO’s into their triple option game, as well as power game with pop passes to the tight end.